Silent & Cheap 3D Printer Upgrades Creality CR-10 In 6 Steps! Is your 3d printer too loud? Is it making a bunch of weird noises that annoy you and you wish it could be more quiet? If so, you are in the right place to figure out how to make it more silent and soundproof! 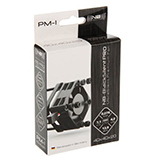 Reduce printer vibrations cheap and fast. Although I am going to show an example for the Creality CR-10 this can be used for almost any 3d printer such as the popular Anet A8. It’s going to take a bit of DIY to silence your printer but these printer upgrades can be done on the cheap with under an hours work. Let’s get to it! Why are 3d printers so loud? What is that weird noise coming from the printer? It sounds like it’s playing a song! Turns out this is from the stepper motors because they are turning so quick they vibrate and make noise. You can even program them to make a song out of it as the below video shows! In order to reduce this vibrational noise you need to place a rubber stepper motor vibration damper on these motors. The NEMA17 dampener is 2 pieces of metal with a rubber middle between them. It attaches to the stepper motor and absorbs the noise and vibrations from the motor. This in turn make the motors much more silent when running. This is a quick, easy, and cheap way to make your printer much more quiet and silent while printing. 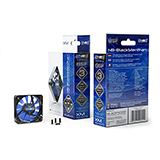 The following is a list of parts used in this upgrade. Below the parts list is the infographic that shows how the upgrades will progress, more details are described below. Be sure to purchase all parts so you can follow along! Use these steps outlined in the infographic to make the CR10 more quiet while running. Follow the above steps with this accompanying video for reference. Don’t be afraid to break anything as the CR-10 is well made and there is not too much damage you can do. 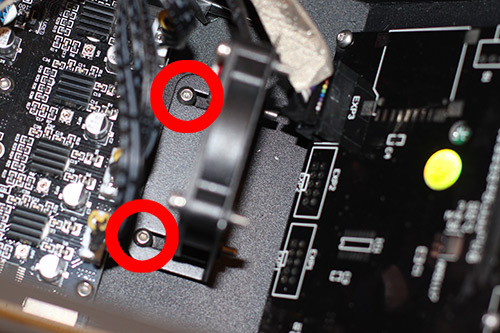 Remove the 4 screws holding the black metal panel attached to the spacer screws with a allen key. Remove the 4 golden spacer screws with a wrench or by hand. Be careful not to bend these and break them! Hold on the the motor when you take out the last screw so it doesn’t drop. Remove the motor and take note of where the belt location is because when you put it back on you want the belt around the same spot. Put the dampener on and use 2 small screws to screw it to the motor, leave the other 2 holes to screw it to the spacer screws that attach to the metal panel. Loosen the 2 black slugs on the gear so that you can move the gear up (these hold the gear in place). Note: if you loosen the slugs and the gear sill wont move, place a screw driver underneath the gear to pry it up. You may need to apply a lot of pressure so be very careful! The gear is just stuck so you need to pry it up. Once you place the gear in the correct position with the belt, tighten the black slugs on the gear. Attach the motor with the 2 space screws and then attach the metal panel at the end. Make sure the belt is as tight as it was before, if not then you need to tighten it. Follow the same procedure here as before with the X stepper motor. Remove the front screws with the allen key. Place the dampener on the stepper motor and use 2 screws to attach it. Move the gear and line it up with the belt. 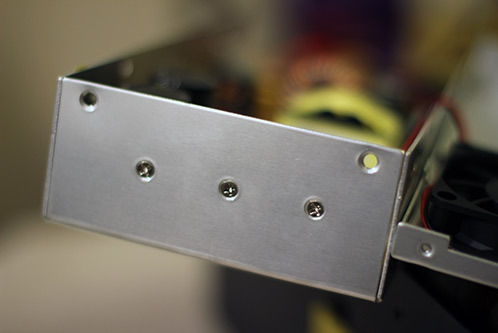 Attach the stepper motor to the metal plate. Remove the screws that are on top holding the plastic extruder to the motor. However this time you are going to want to flip the gear the other way so that the slugs are on top (makes it easier to position later on). Attach the dampener and then attach the motor back onto the extruder. Move the gear to a position that is in line with the other parts of the extruder. Put the extruder back together and tighten everything! Now it’s time to remove and replace the cooling fans inside of the control box and on the hotend! 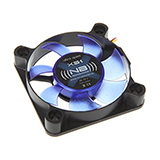 These new fans are better designed and will sound a lot quieter. BEFORE YOU CONTINUE MAKE SURE THE CR-10 IS UNPLUGGED!! Turn the control box over and remove all the screws. Next turn the control box on the side and remove the screws that are attached to the power supply. Once those are off bend the metal shell of the control box a little and the power supply should come out. Flip the power supply over and it should be able to rest outside of the control box. Start with replacing the front 50x50x10 mm fan in front of the control box next to the LCD panel. Remove the bottom 2 screws that attach the fan. Cut the red and black power cables and strip those wires. 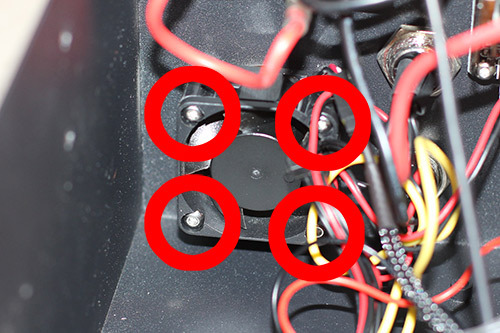 Take the new fan out of the box and cut the power wires to expose them, then strip these wires. 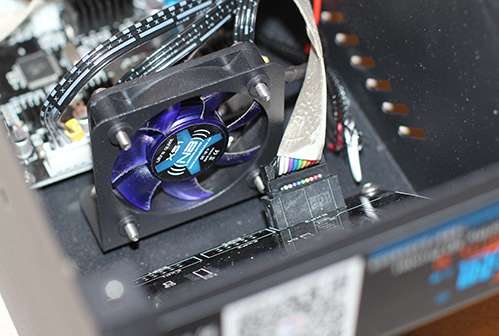 Combine the power cables from the old fan power supply to the new fan and use electrical tape to hold them together. Screw in the new fan and make sure its going the correct position! Make sure none of the wires are hitting the fan. Next move on to the 40x40x20 mm fan in the back of the control box. Go through the same procedure as before. Note that everything is very well labeled in the control box so if you think you need more room to work feel free to unplug things, just make sure to plug them back in the correct spot! 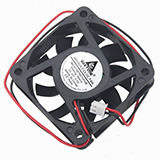 Finally you will want to replace the 60x60x15 mm power supply fan. Double check that the control box is unplugged before proceeding. 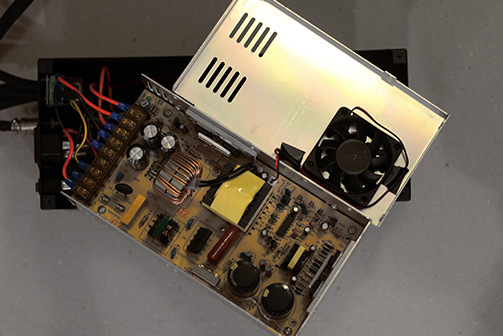 The power supply has large capacitors in it so be very careful. These will discharge after about 30 seconds so just wait a bit after unplugging before doing this. I just try to avoid touching them all together. 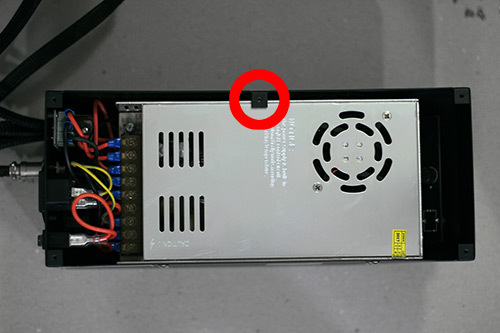 Remove the 6 screws from the power supply enclosure except for the bottom back 3. There should be 2 screws on each side that you remove. Unscrew the fan on top and replace it with your new one. 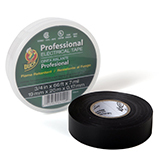 Make sure to use electrical tape and tape the hanging wire to the sides or top of the power supply, you don’t want that wire to interfere with anything. Put everything back together and you should be all set to go. This completes the step of replacing the fans inside of the control box. The final step is replacing the fan in front of the hot end. 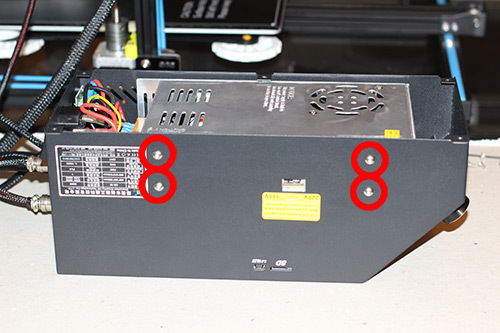 Unscrew the hot end enclosure to expose the hot end and the two fans. Cut the wires for the 40x40x10 mm front fan as this is the one that will need to be replaced. The other fan doesn’t make a lot of noise so no need to replace. Do the same procedure as before were you connect up the power wires and wrap everything in electrical tape. Put everything back together and you should be all set! The next step is optional but you may want to do it if you have time. There is a lot of vibrational noise that comes from the CR-10 base vibrating against the table that it is on. 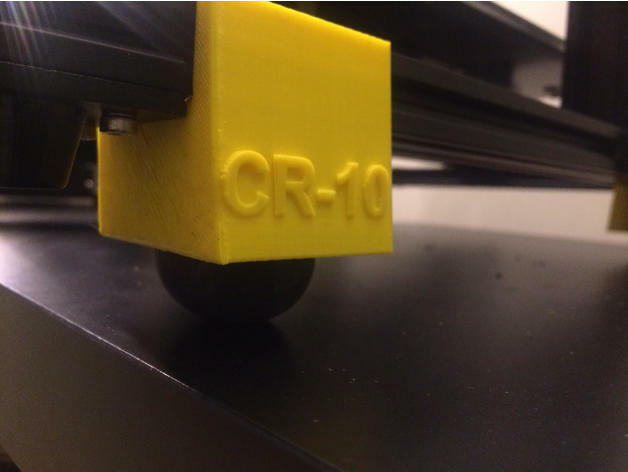 In order to alleviate that you will want to place squash balls at the base of the CR-10, replacing the small plastic feet that are on there now. In order to do this you will also need to print out 4 parts that hold the balls in place. Congrats! You have now successfully completed a printer upgrade to make your CR-10 quiet. Note that this will also work with the Anet A8 and other printers. The concepts are all the same. You want to add stepper motor dampaners and replace the stock fans with quiet and more silent ones. Now that you are ready to start printing head over to my other blog post Nylon Filament 3D Printing In 3 Simple Steps to start printing with nylon! 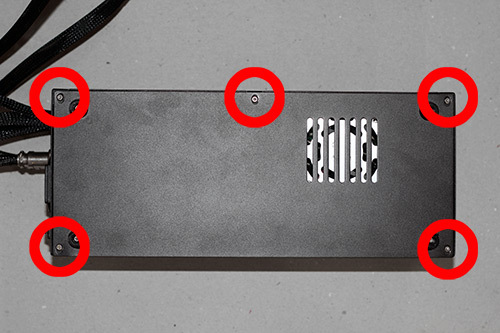 Did you find that the XS-1 fan didn’t move enough air with just the black and red wires? I’m using an XS-2 fan in my kit, and a test run outside the box just doesn’t seem to evoke the 4000RPM the fan specs out at. Does the white wire come into play. I am searching for a wiring diagram online – with little luck. 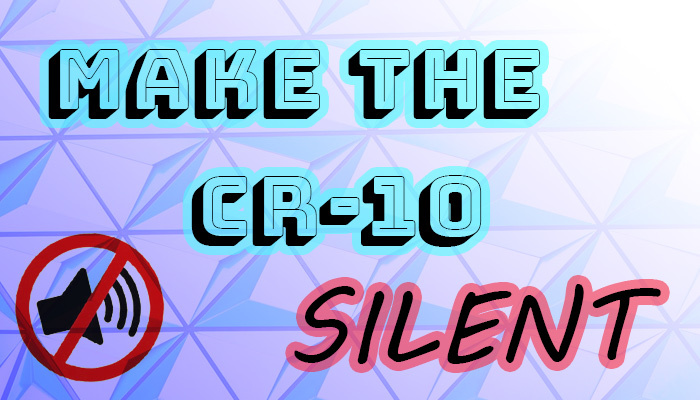 Nice article by the by – great run-down to making the CR10 quiet. I just got a new CR10S and it is all-but quiet (just a little bit of noise from the power/control box. Thanks, I seemed to be fine with the XS-1 fan. Although I wasn’t really looking for power, I was more just looking for the correct fit and a silent fan. The white wire is the sensor wire (might also be seen as the tachometric, signal or revolution wire) it is used for controlling the speed of the fan. I just took what ever the old fan was connecting to and wired it up the same. I would suggest 2 things. First, use a multimeter and make sure your connections are solid to the fan. Maybe its just the case that your connections are bad. Second, I would try connecting up the white wire, this may help with fan control. Let me know how things go and I can help more if needed.